Isla Isabela was a fascinating, though sadly rather brief transition from the Baja to the mainland. 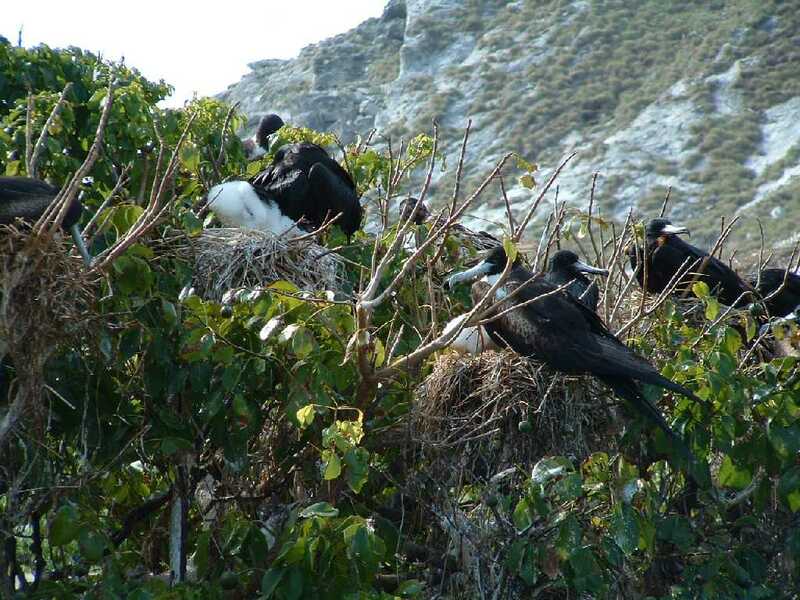 The island is a wildlife sanctuary, where thousands of frigate birds and boobies breed every year. In addition, whales cavort in the waters around it during the migration season. Wandering around the island is fascinating. Frigate birds are notorious for their aggression and fierceness, yet when they are nesting you can wander within a couple of feet of them and their chicks, while they do no more than make throaty grunting noises of discontent. The island deserved greater inspection and contemplation than we could give it. The forecast came up with strong eaterlies for a confined rocky anchorage with poor holding, so we bailed out after a single night and headed for the mainland. 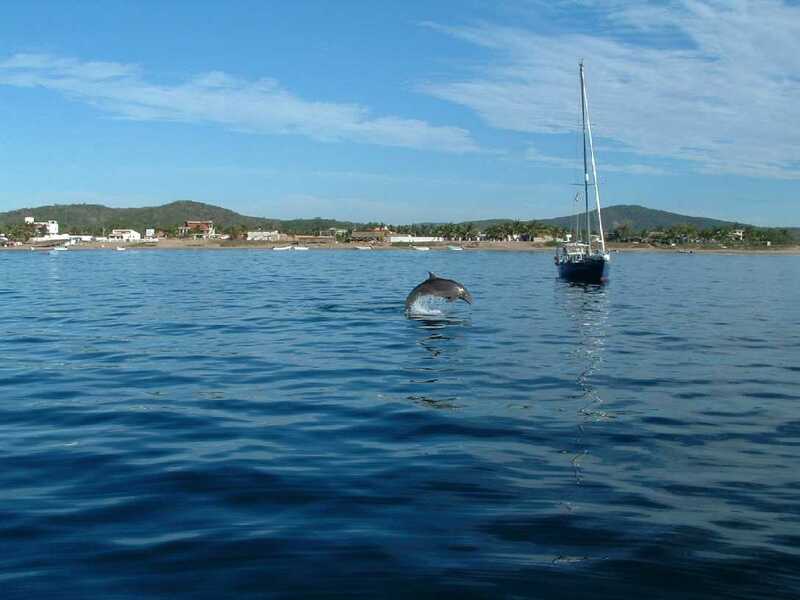 'Real' Mexican cruising starts at Banderas Bay, at the head of which is the large tourist city of Puerto Vallarta. There is a whole skyline of hotels and condos around the city, with two or three associated marinas. However, along the north shore of the Bay, about 15 miles from PV is La Cruz Huanacaxtle, a small, quiet and quite picturesque town - certainly the prettiest non-tourist town we saw in Mexico. We enjoyed exploring the quiet streets and small shops. Noisy, but speedy buses could get you into PV in forty minutes if you were so inclined. The anchorage was filled with cruisers, but surprisingly quiet. We had heard numerous boats checking in from Tenecatita on the various SSB cruisers' nets for months. Many of them seemed to be permanently attached to the bottom of the anchorage. When we got there, we found out why. The anchorage is well sheltered behind attractive rocky outcrops, with a long sandy beach as a back drop. There is an interesting 'jungle-ride' for 3-4 miles through the mangroves to another lagoon just behind the beach where Bahia Tenecatita joins the Pacific Ocean. 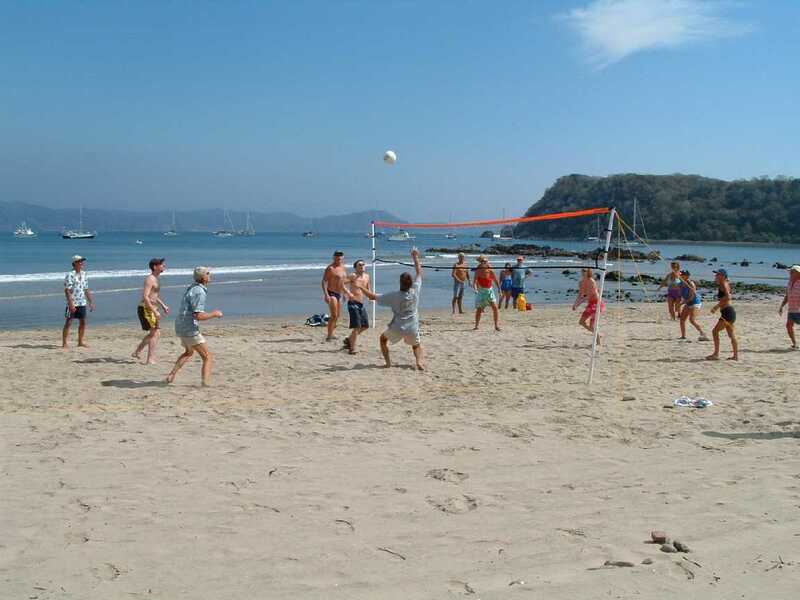 There are enough semi-permanent residents of the anchorage that there is a 'mayor' and a fairly regularly planned set of beach and social activities. It has all the advantages of a thriving village and few of the disadvantages. Plus, any time you feel like it you can go somewhere else. 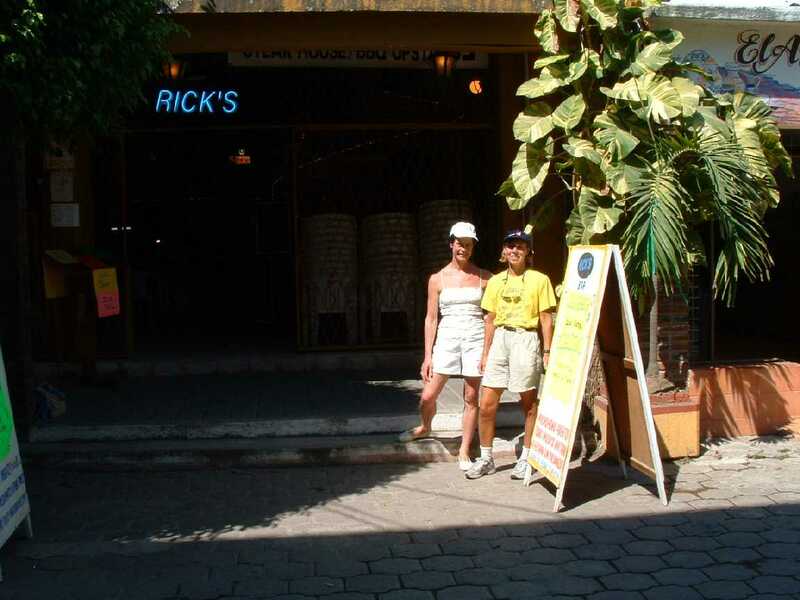 We indulged in full immersion for about a week, enjoying ourselves thoroughly, but the 'road' and a planned rendezvous with Tom's sister, Inge, beckoned and so we headed on to Zihuatanejo. Zihuatanejo was full of mixed blessings. On the good side, we met lots of interesting, friendly and delightful fellow cruisers; though the town was touristy, we enjoyed exploring its variety; we had a good time with Inge, giving her a proper Mexican holiday and her first snorkeling opportunity. On the other hand, the temperatures in Z-town were decidedly warmer than in Tenecatita and not at all to our or Sunstone's taste; Vicky's hip started playing up and on visiting a local doctor she was told that the joint was so worn that she would probably need a replacement long before her warranty expired; and finally both our laptop and hand-held computers were stolen from the boat, which embroiled us in lengthy interviews with and reports to the police. Everyone was very sympathetic, as helpful as they could be and made encouraging noises, but it was clear that we would not see the computers again. Ironically, this came at a time when Yachting World had asked us for an article on Mexico, with a very short deadline. Thankfully, between Heike, the wife of Rick of Rick's Bar and other cruisers, loaned computers allowed us to meet the deadline. Having said good-bye once to San Diego, Tom now returned via a flight to Tijuana (internal Mexican flights are much cheaper than international). Joseph and Marci not only kindly provided a bunk aboard Horizon for five days, but Joseph also drove Tom over hill and dale in search of the best price, for new computers, San Diego had to offer. This was pretty good after a certain amount of bargaining - even in the big discount stores it pays to ask for even more discount. In the meantime, Vicky varnished and gave South Pacific cruiser seminars to prospective 'puddle jumpers'. By the time Tom returned we were eager to make our escape, dragging a bottom full of crustaceans with us grown in the 'nutrient-rich' water of Bahia Zihuatanejo, into which the town pours much of its domestic sewage. By the time we left the Bay we were feeling somewhat jaded, not just about Z-town, but our whole Mexican experience. We arrived in our last Mexican port fully ready to buy fuel, stores and leave for Costa Rica. However, within a few hours of arrival, we felt better about Mexico. The town was pretty and clean, the marina was well run by the very friendly and helpful English-speaking manager, Enrique, and the other cruisers were a sociable group. By the end of the first day, we had decided to stay a little longer and make an inland trip to Oaxaca, the historic colonial capital of the state and also a centre from which to visit a variety of Zapotec ruins and cultural sites. In fact, this trip was one of the high points of our time in Mexico, partly because of the delightful company of Steve and Carol from 'T'ai Li'. 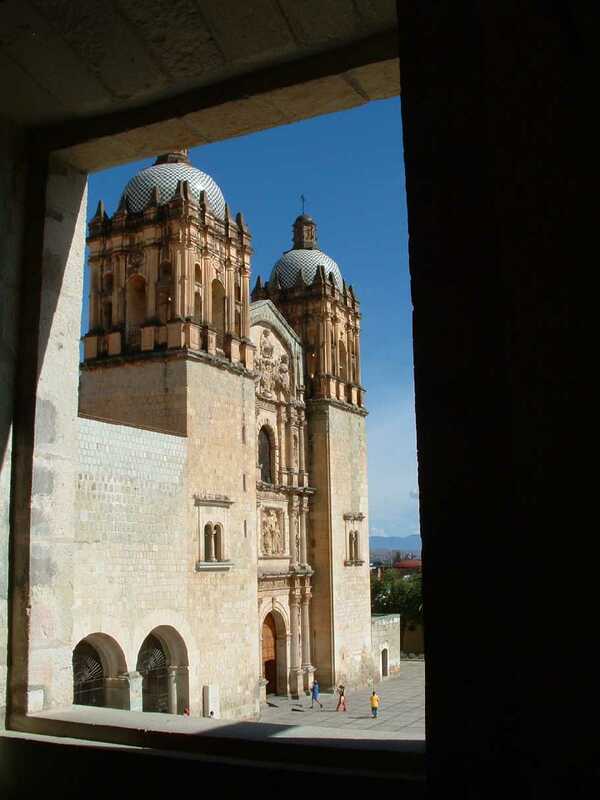 Oaxaca is an attractive city, with lots of Spanish colonial architecture and an interesting and beautiful Dominican monastery. It was Easter weekend, so there were elaborate community processions everywhere, with garishly decorated statues of Christ and Mary carried solemnly shoulder-high in the Spanish tradition. Good Friday seemed to be a good deal more important than Easter, perhaps in keeping with the fascination with blood sacrifice which is a theme of most of the Mexican and Central American pre-Columbian cultures. The catherdral square each evening was thronged for the 'paseo'. The Zapotec ruins at Monte Alban were fascinating, not only for their huge scale, but also for their manner of construction. As part of our tour we also visited a carpet weaving work shop, which produced beautiful work, all of it woven on hand-looms without the use of a shuttle and therefore very slowly, but producing very intricate designs. We had taken the night bus to Oaxaca, but came back by the shorter route through the mountains in daylight - the road is too dangerous to allow a night bus. The switch-back route gave amazing views from the high ridges, where the air was cool and slopes heavily tree clad; it was very un-Mexican scenery. Our driver was very skilled, but also knew no fear. He threw the little bus into corners with abandon and accelerated out of them like Michael Schumacher. We breathed a little more freely as we emerged onto the coastal plain. 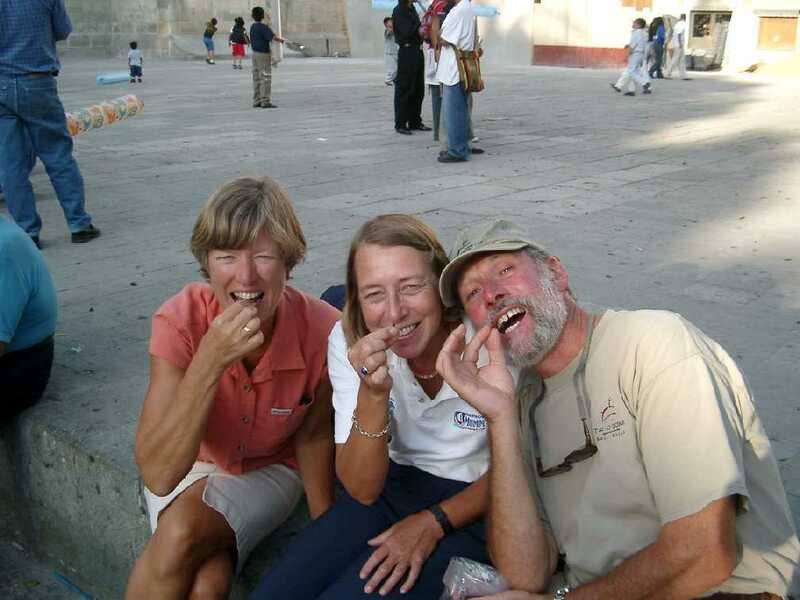 Carol, Vicky and Steve sample a local Oaxacan delicacy. Yes, those little brown blobs on the tips of their fingers are fried grasshoppers. They come in pequena, media and grande. These are media. Cruising in Mexico had held few surprises for us, perhaps because we had talked to many people who had cruised there. As we had thought, we much preferred the Sea of Cortez to the mainland. The scenery, though stark, was attractive and the anchorages were uncrowded. Despite the impact of gringo tourism and development, we still felt that the Baja was distinctively Mexican. On the mainland coast, the impact of tourism is such that it is hard to get a feel for the 'real' Mexico. Probably you have to go inland to find it and even then you would have to speak much better Spanish than our stuttering attempts in order to communicate effectively. Somehow, despite similar barriers of language it was easier to get some feeling for the culture and pattern of life of those we met in Vanuatu than in Mexico - even though village life in Vanuatu is much further from normal western life styles than that of the average Mexican. We had ambivalent feelings about the Mexicans we met. Most were friendly and helpful and some were as warm and generous as any people we've met anywhere. However, the relationship between the USA and Mexico seems to have developed an attitude in many Mexicans that any gringo is fair game, not merely for the kind of understandable 'blue eyed tax' you find in many poorer countries. We were repeatedly short-changed in Mexico, even in quite large chain stores. When the mistake was pointed out, it was always smilingly corrected, but there were no embarrassed apologies and it did happen a lot. We heard of other instances of work paid for, but not carried out, as well as minor thefts. Mexico does not have a good reputation in this respect. And of course the other side of the matter is that not all cruisers behave wonderfully toward Mexicans. While cruising in Mexico, we also had to keep reminding ourselves that for many of the cruisers we met, this was their first big adventure and that the general level of experience among Mexico cruisers is relatively low. Fortunately, the winter weather along the mainland coast is generally benign and fairly undemanding.